I arrived here in the UK just in time to see (not literally) Nigel Farage’s UKIP party win their first seat in the UK Parliament. It was a bit of a cheat, really, given that the the guy who got elected was already the MP for the area, merely for a different party. That said, unlike the situation in SA, he had to be re-elected under the UKIP banner, and he was. They now control 1/650th or about 0.15% of the UK political landscape. But that’s only if you choose to look at the number of MPs. Because even though the traditional main three parties have just held their respective conferences, all I’ve seen on the TV here is Nigel and UKIP. Repeatedly. And, if this infographic below is true (and I haven’t had time to check on the veracity of it because that’s not what I’m here for), then my viewing experience could well be easily explained. Question Time being a much-watched and much-debated TV programme here, this is important. The thing is this: despite their unpleasant policies and lack of any workable plan should they be elected (or maybe actually because of that? 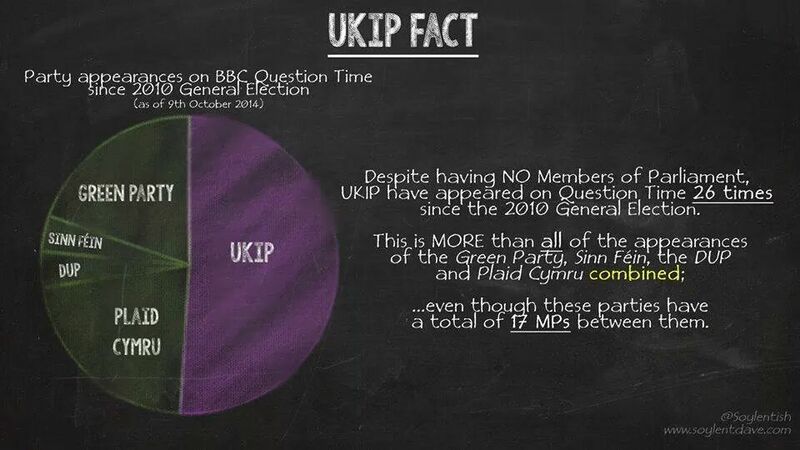 ), UKIP have shaken the political landscape here and they have become the media darlings because of it. They don’t have a presence in Parliament (save for that one brand new seat), but they are the go-to party for opinion and soundbites which are going to get the viewers to your news programme, paper or website. And coming from SA, that situation seems rather familiar. Of course, Julius Malema and his EFF have a few seats in the SA Parliament. But it’s still a tiny presence. And yet their vocal, no holds barred, sabre-rattling approach to everything has repeatedly made them headline news. But they’ve actually achieved nothing through it. Has Jacob Zuma paid the Nkandla money back? No. Has Baleka Mbete resigned? No. And yet, the EFF still get the headlines, despite not actually adding anything positive to the parliamentary mix. OMG! They shouted! They chanted! Floyd stuck up his middle finger! They walked out of parliament again! So did they get all their demands satisfied? There’s a common thread here, despite the vastly differing politics of Nigel and Julius: people are very unhappy with their incumbent government and the incumbent government seems to be doing nothing to remedy that situation. Suddenly, there’s a power vacuum and that’s something that these populist, radical parties have stepped in to exploit. And they’re exploiting it well, because while they’re not in power they can make a lot of noise and a lot of promises without actually having to back any of it up or be taken to account. They can react quickly to individual incidents, switch polices and respond with no comeback, save for the mainstream political parties (who would try to shout them down anyway, and who no-one is listening to anyway, of course) the media (who love the devil-may-care attitude because it brings them more readers or viewers). The next general election for both countries is going to leave a very different political landscape. And that’s fine, because that’s how democracy works. But, much like that Trevor Mallach letter, it would be better if we went into these things making decisions based on facts and not on what the media spin. Right now, the EFF and UKIP are getting all the positive press coverage while having to do nothing to back it up. Would either of them actually be able to successfully run a country (or even an opposition party) given the chance? I can’t see it, personally – although the media might want me to think differently. Boris Johnson is the incumbent mayor of London and he’s a polarising figure. I think he’s great, and I’m not alone in that – he was recently revealed as (easily) Britain’s most popular politician, albeit that the competition wasn’t up to much, consisting, as it did, exclusively of British politicians. Boris is undoubtedly a star attraction in British politics and the Conservative Party will be pleased to have him onside in 2015. A Tory that can win in London is a rare thing and what makes Boris so attractive within the Party. Some of the stuff he does and some of the soundbites he comes out with make me cringe, others make me wish that Cape Town’s mayor, Patricia de Lille, had a bit more personality and a bit more gees about her. But her attitude is more to toe the party line. Boris’ attitude is not to give a flying toss about the party line. He’s a law unto himself, but if you believe that there’s nothing behind the apparent buffoonery of his outward image, I think you’re mistaken. You don’t get where Boris is by being a buffoon. Acting one, perhaps – being one, no. Speaking to Conservative Party members, he suggested UKIP should throw its weight behind the Tories in order to defeat Labour and secure an in/out referendum on Britain’s EU membership in next year’s general election. He told the rally: “The EU commission wants to ban vacuum cleaners on the grounds that they are too powerful. If you do not handle your vacuum cleaner correctly, you may end up inhaling the hamster – the budgerigar through the bars of the cage. Yes. He’s basically saying that his political opponents have intimate relations with electric cleaning equipment. Spectacular. It’s weirdly similar to (a classier version of) Julius Malema’s immaturity (and without the charges of racketeering and 52 other allegations, including fraud). Whether it will work any better than the EFF’s very vocal, but wholly ineffective shouty parliamentary behaviour remains to be seen. Either way, I love Boris. P.S. Incidentally, for the record, I don’t think you get where Julius Malema is without being fairly clever, either.